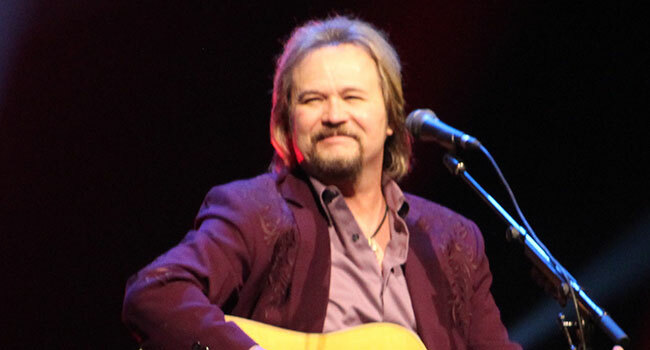 Travis Tritt ended a two week run of solo acoustic dates with a sold out show at the Bakersfield Fox Theater on Veterans Day that had everyone laughing and singing all night. Tritt walked on stage sporting a purple shirt and purple suit coat with jeans. He and his band — aka his acoustic guitar — spotlighted 23 songs from a stool that spanned nearly two and a half hours for unique versions you won’t hear with is band. Tritt kicked off the unique and intimate show with “It’s All About The Money” before launching into a massive string of hits including “Where Corn Don’t Grow,” “Modern Day Bonnie And Clyde,” “Country Club,” “T-R-O-U-B-L-E,” “Here’s A Quarter (Call Someone Who Cares)” and more. He launched into “Country Ain’t Country,” a song he first recorded because he liked, but is “damn sure trying to make a statement” today. The crowd went nuts. There is not a better artist you could spend Veterans Day with than Travis Tritt. That showed towards the end of his set as he honored all Veterans with “Anymore.” The video, in which Tritt portrays a wheelchair bound Vietnam Vet living in a rehabilitation clinic, was filmed at a Veterans hospital in Murfreesboro, TN. Tritt and a few others were the only non-Veterans appearing in the video. Tritt shared how nervous he was to portray the character of Mac Singleton since he never served himself. However, he was embraced by the Veterans excited to have their side of the story told. The experience had such an impact on his life that Tritt had to do more. Throughout the Nineties, he became the celebrity spokesperson and advocate and chairman for the Disabled American Veterans Association (DAV) for four years in a row and serving another two years with the Veterans of Foreign War (VFW). Tritt also paid tribute to his musical heroes, including Waylon Jennings, The Beatles (whom he’s never covered before these acoustic shows), Elvis, Bobby Bare and Jerry Reed. Songs included “Are You Sure Hank Done It This Way?” “Five Hundred Miles Away From Home,” “Help” and more. He ended the main set with “T-R-O-U-B-L-E” before thanking the crowd and walking off stage. His encore only consisted of the gospel standard “Will The Circle Be Unbroken” with Tritt claiming he rarely gets encores. As my first time seeing Tritt live, I was really hoping to see a rocking full band concert, but Tritt brought the party anyway! It was very cool to hear these stories in the way they were presented, something he most likely wouldn’t have done had he had his full band with him. Tritt has been doing solo acoustic shows for a few years now, even capturing a Nashville-area performance with A Man And His Guitar (Live From The Franklin Theatre) in 2016. If you can catch one when he’s near you, be sure to do so. You won’t be disappointed!